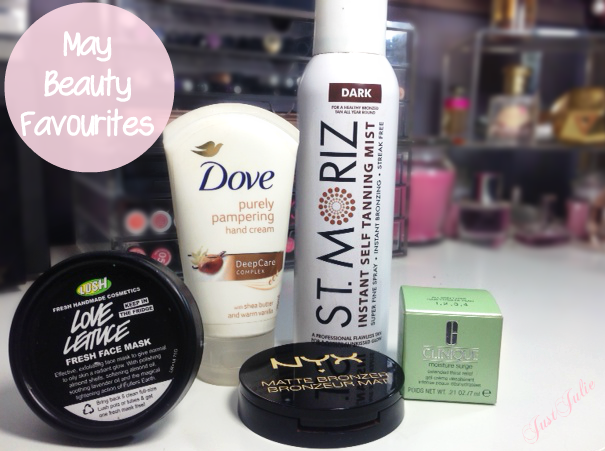 Another month complete and another month of beauty favourites! I swear if this year goes any faster, Christmas will be upon us in no time! Yes you can tell from this picture that there is just ONE makeup product! Shocker!!!! I did originally have like 12 items but needed to get that number down and these items have been my stand out favourites this month! Lush Love Lettuce Face Mask: Aside from the Lush Grease Lightening Spot Treatment, review just HERE the love lettuce face mask is the first proper skincare product I've used from Lush. I've seen their face masks raved about on blogs and on YouTube so two months ago I finally picked up this one, after them always being out of stock. The lady in the shop told me it would last for a month and I was like whoooa, I only use a face mask once a week! She explained that they go off after a while due to the ingredients being 100% natural BUT that the month is just a guideline and that she has had face masks last longer. As I have oily skin that's dehydrated this was the one they recommended. the French Lavender is great for controlling sebum and the honey and almond are good for hydrating the skin without adding excess oil to your skin. repurchasing this again this week! Clinique Moisture Surge, Extended Thirst Relief for all skin types: As part of me trying out new skincare I got a couple of luxury samples of this to give it a good try and OMG I love this! It's a gel moisturiser which really hydrates your skin! They do one specially for dry skin, but this is the one that will be suitable for normal to combination skin. I have only been using this at night time as it doesn't have an spf, which I like to have in my moisturisers. A little goes a looong way! My first sample lasted me just over two weeks! My skin feels so soft and hydrated in the morning since using this and I will be buying the full size this month! Dove Purely Pampering Hand Cream: I ran out of my favourite Soap and Glory hand cream and literally have a cupboard full of hand creams so I've now moved on to this, and I have to say, I may like this more than the Soap and Glory hand Glove! You need the smallest amount of this and it leaves your hands feeling silky! It doesn't leave your hands feeling sticky either, which is something I detest in a hand cream. The scent is shea butter and vanilla so it smells amazing! St. Moriz Self Tanning Mist, in Dark: So the other week I pulled out one of one of my Fake Bake self tans and it was coming out green!!! Yes green! In all my years of self tanning this has never ever happened to me! So yes I wasn't impressed! I bought two St.Moritz self tans a while back, the spray and the mouse, but hadn't got round to trying either of them. Yes I know I'm slow on jumping on St. Moritz fake tans! I decided to try the spray, as I tend to prefer sprays as they're quick to apply and normally easy to blend in. Why it took me so long to try this I don't know! The colour is great and totally buildable! It's easy to blend in and dried in next to no time! I really loved the results! So amazing for a cheap fake tan! NYX Matte Bronzer: I've used this in quite a few of the makeup looks that I've posted but it wasn't a bronzer that I would tend to reach for on a daily basis, until this month! I like a matte bronzer and have hit pan on a few of my favourites and because I don't want to use them all up I started reaching for this and you know what, I love it! It's totally matte, the colour isn't too dark, I have it in medium and it's excellent for contouring. I've actually now hit pan on this too, so I best slow down with this and go use one of my many other bronzers! ha!!! So that's it for my monthly favourites. It's always so hard to narrow everything down to just a few items, but these were the products that I have really enjoyed using this month! What's been your favourite products this month? Leave me a link to your favourites post if you've done one!